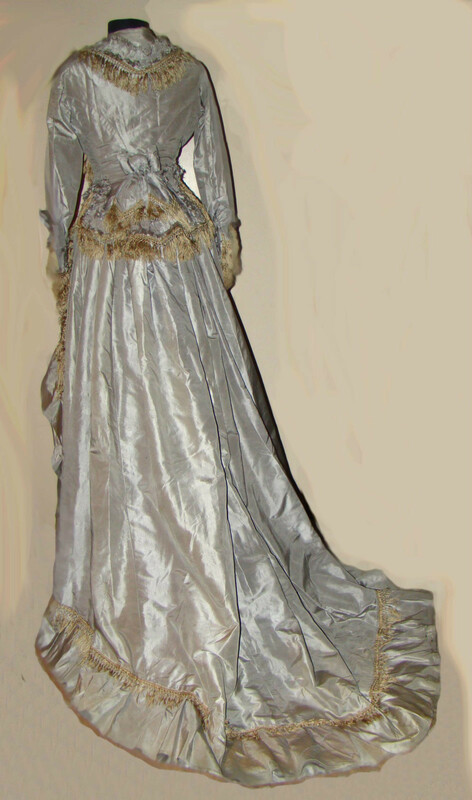 Exceptionally beautiful light gray tissue taffeta bustle dress with train dates back to shortly after the end of the Civil War...the hoop skirts are gone, giving way to the bustle. The dropped shoulders and pagoda sleeves are still in vogue and are in evidence in this bodice. 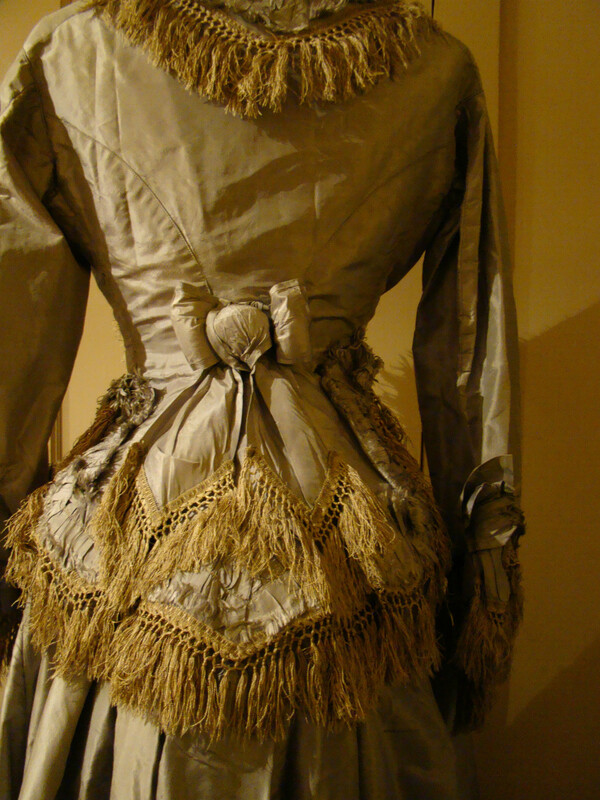 Double rouched and fringed trim made from the same fabric as the dress is generously used, along with ecru silk fringed braid, to give the impression of an open vest, running around the neck, down each side and trimming the bottom of the peplum that is pleated and elongated to cover the top of the bustle. 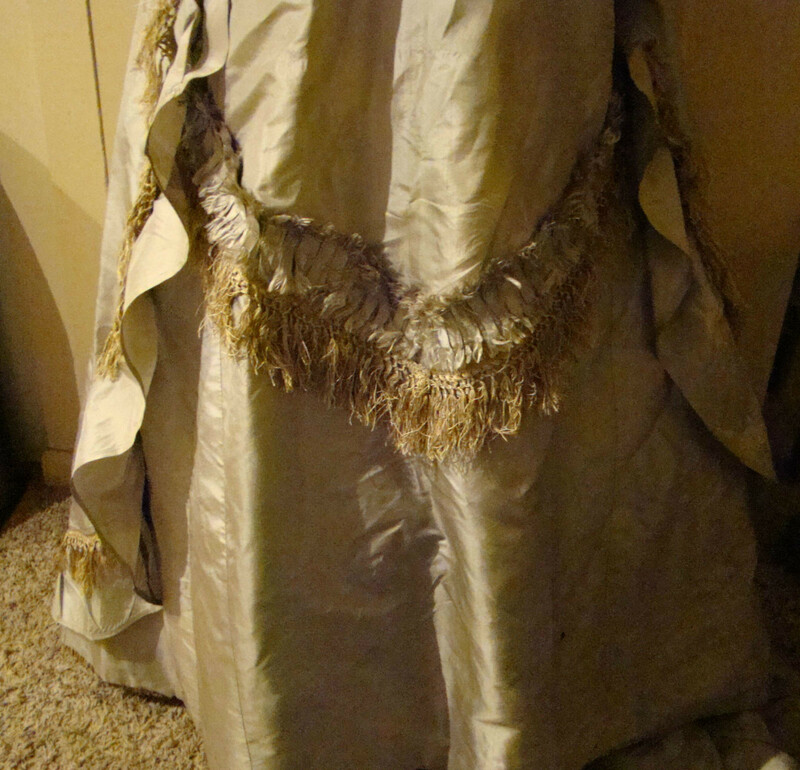 There is a fringed rosette bow at the center back of the bodice. 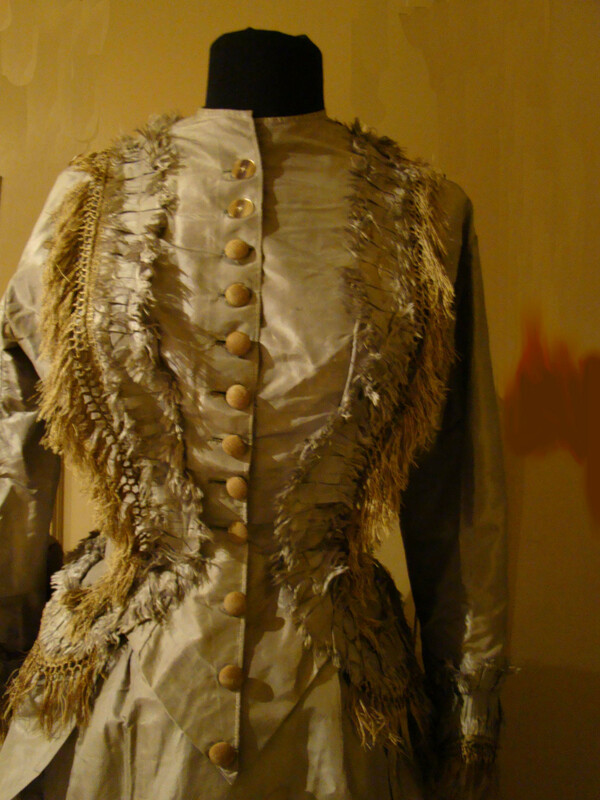 The same rouched and fringed trim can be found at the bottom of each sleeve, which are pleated and trimmed at the back with fringed rosettes. The graceful skirt falls 40" to the floor in the front, and 60" in the back. The skirt features a 7" ruffle trimmed with ecru silk fringed braid that falls from each side of the front of the skirt and around the bottom of the skirt, giving the impression of an overskirt. 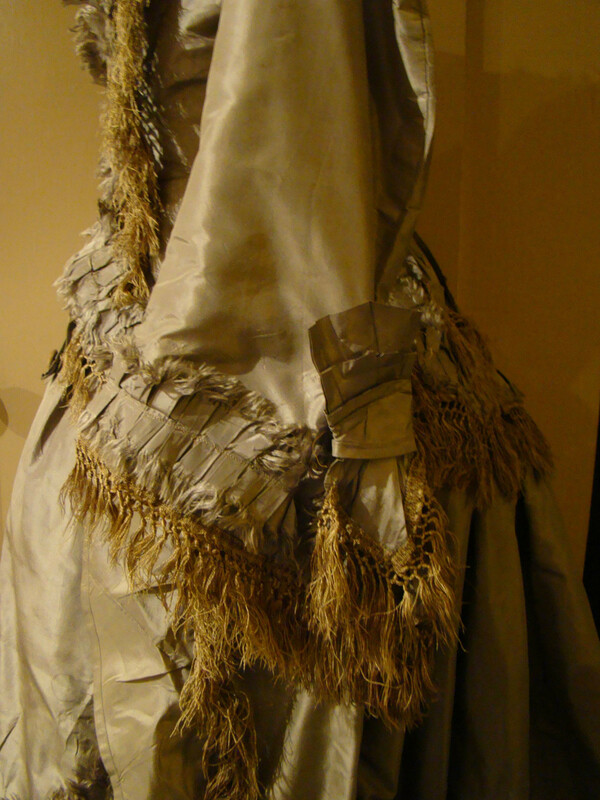 More of the rouched and fringed braid trim forms an apron between the ruffles at the front of the skirt. Missing in the photograph is a fringed rosette that is pinned at the throat, covering the two pearl buttons that have replaced original buttons that were lost. I found one of the buttons in a hidden pocket on the skirt and will send it and the missing rosette for the neckline with the dress. There are a few water spots and some wear damage along the bottom of the front of the skirt. Stabalizing repairs have been done with contrasting thread in large stitches so there is no mistake where repairs have been made. 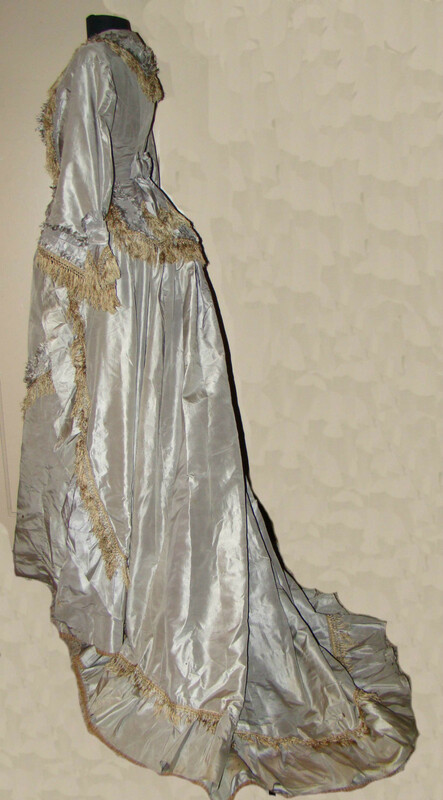 There is no splitting or shattering of the taffeta, which is in very good condition considering the age of this garment. The bodice is boned and measures 24" in the waist, 15" across the shoulders in the back, and 15" top to bottom in the back. I have examined the dress and feel I have represented it accurately. 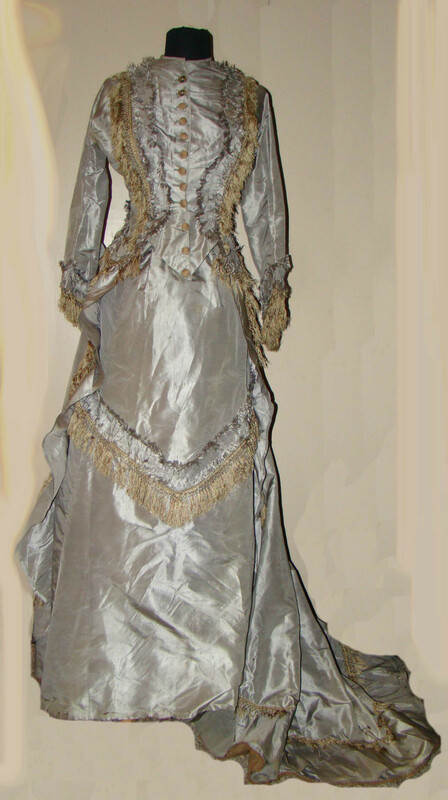 It's an exceptional example of the transition between the full hoop skirts of the early 1860s and the constraint of the frocks of the early 1870s. It's 1870's, but later than the seller believes. I'd guess about 10 years post War if not later than that!